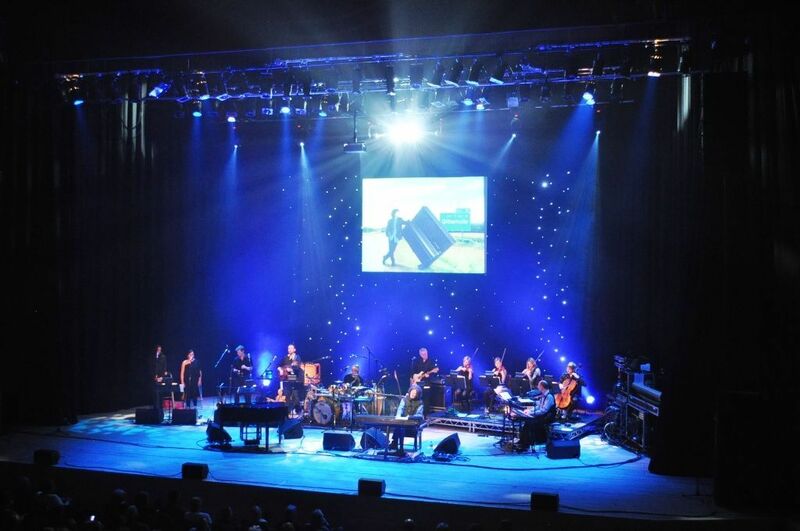 Martin’s Lights has worked with Gilbert O’Sullivan for more than a decade and has seen him re-establish his audience during that period, with Gilbert moving up from playing small arts centres to concert halls and theatres. Since 2007, we have worked closely with Gilbert’s manager Kevin O’Sullivan, and his audio team of Kevin Sefton and Francis Gardner, to improve the production values of the live shows and Gilbert now tours full PA, video projection and a lighting extras package. Gilbert’s tour in March and April 2012 took in fifteen venues in the UK and Ireland. Martin’s Lights supplied a 15 metre x 6 metre LED starcloth, six Robe Colorspot 575AT moving lights and eight 36x 1W LED Par 64s. This lighting package, and the in-house lighting systems, was controlled with a ChamSys MagicQ PC and Maxi Wing. Martin’s Lights also supplied flight cases for the band’s backline, and rigging accessories for the projection screen.